In 1995 he was acquitted of the murder of his ex-wife Nicole Brown Simpson and her friend Ron Goldman. Simpson has expressed his desire to move to Florida after leaving jail. His lawyer, Malcolm LaVergne, told Reuters news agency that his client's whereabouts would be kept confidential for now. But Florida's attorney general, Pam Bondi, has publicly sad the state does not want Simpson to serve his parole there. The state, she tweeted, "should not become a country club for this convicted criminal". The football player was sentenced to a maximum 33-year sentence in 2008 after storming a Las Vegas hotel room with five others in an effort to seize items from two sports memorabilia dealers. OJ Simpson case - where are they now? 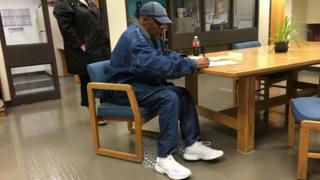 In July this year, he was granted parole and approved for release in October. Simpson was found guilty in 2008 exactly 13 years to the day after he was famously acquitted in the double-murder case. Despite the 1995 not-guilty verdict, a civil court jury held Simpson liable for the deaths of Brown Simpson and Goldman, awarding $33.5m (£25m) to their families. A lawyer representing Ron Goldman's family told Associated Press this amount had nearly doubled with interest under Californian state law, and that the family would continue to seek payment from Simpson after his release. His lawyer said on Wednesday that he was feeling "very upbeat" ahead of the release. Simpson became a cult figure in the National Football League (NFL) after record-breaking performances for the Buffalo Bills team. After retiring in 1979 he starred in television shows and movies, including the 1988 film The Naked Gun. 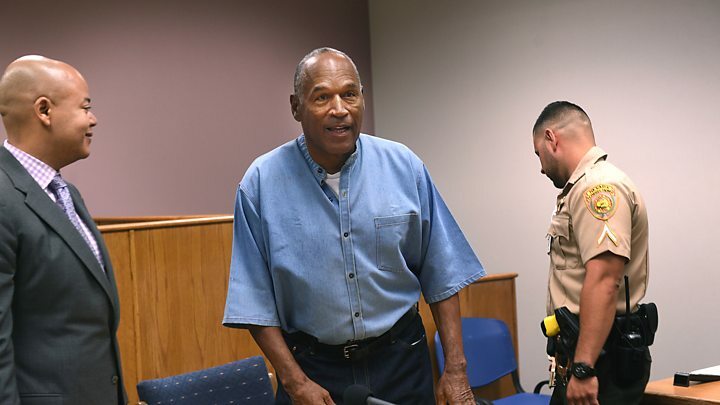 The OJ Simpson trials: Where are they now?